A MULTI-million pound museum to create the biggest ­memorial in the world to more than 5,300 Commonwealth sailors killed in the line of duty, and honour Scotland’s role in the ­development of submarine technology, is planned for the banks of the River Clyde. Award-winning architect ­Gareth Hoskins, who designed the £47 million National Museum of Scotland redevelopment, the Culloden Battlefield Memorial Centre and the Bridge Arts Centre, has been asked to draw up plans for the new £6m building overlooking the Firth of Clyde at Helensburgh. Funding for the proposed Scottish Submarine Centre is being sought from a consortium of private and public bodies with organisers claiming to have secured pledges of more than £1m so far. An application for £240,000 is due to go before the Scottish Regional Armed Forces Community Covenant Awards Board for approval later this month. The Community Covenant grant scheme was launched by the Ministry of Defence in August last year. It offers funding of £30m over four years to UK projects which strengthen ties between serving and former military personnel with their communities. The proposed Submarine Centre will be the only one of its kind in Scotland. Already, the Royal Navy Museum has agreed to donate an X51-class submarine as a centrepiece of the state-of-the-art digital museum to act as a memorial to submariners from around the world. The midget submarine is a direct descendant of the X-class subs whose crews trained in the Firth of Clyde during the ­Second World War to develop the techniques needed to attack enemy shipping in the narrow fjords of Norway. 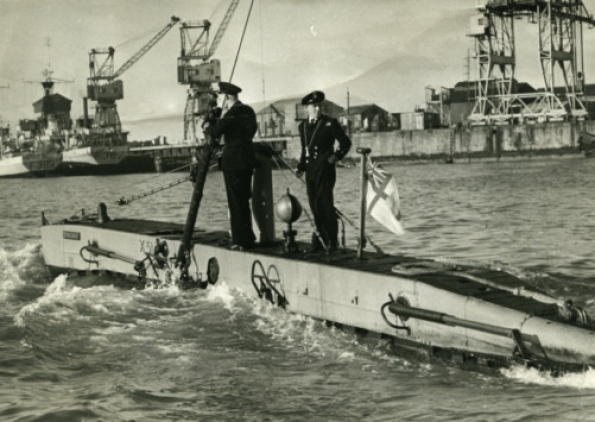 The X51, improved on the wartime midget submarines, was first unveiled in 1954 on the Gareloch in the Firth of Clyde. Capable of carrying a crew of five, the miniature subs were used for a variety of roles. However, the history of submarines and the Clyde is much longer. It is hoped the new facility will open by the end of 2016 in time for the 100th anniversary of the K13 disaster. Thirty-two people died when the steam-driven submarine failed during sea trials in the Gareloch near Helensburgh on 29 January, 1917 within sight of the location proposed for the new museum and memorial. Brian Keating, a Helensburgh-based businessman who is driving the project, said: “Helensburgh and the Clyde have been associated with the submarine service for more than 100 years. A lot of work was done here to pioneer the technology. “The Clyde has also played a major role as a home to submarines on active duty. Many of the most famous and daring ­missions carried out during the Second World War either began here or were in some way connected with the Clyde. Architect Hoskins, a native of Helensburgh, was recently awarded a series of top awards. This entry was posted in UK Submarines and tagged Gareth Hoskins, Helensburgh, K13, museum, river clyde, Stickleback, Submarine, X51 on July 30, 2013 by jasonlockley. The guy to the right in the picture is my late Father in Law, David (Lemmy) Strang, who passed Perisher and went on to command a load of boats. I have some materials from Stickleback and will share them with the new museum in due course. What are they going to call the museum? Faslane maybe, if the SNP get their way? We need more Subs far more than we have/more air craft;;reduce army by 60% of what is today;;spending money on navy first;then Air Force second.